Many readers will know that we have a holy well in Faithlegg dedicated to St Ita. January 15th is her feast day, (she reputedly died on this day in 570AD). We looked at St Ita around the same time last year, and I left it with a question in terms of why the well is dedicated to her. I still haven't answered this to my personal satisfaction and have a few more thoughts on it, but to begin, here’s an overview. 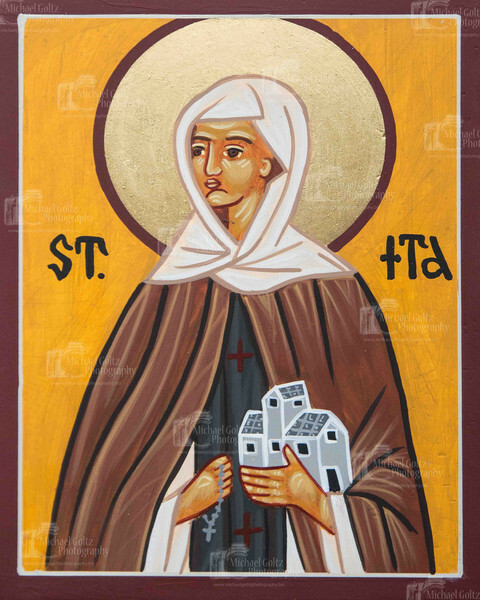 Ita travelled throughout the Deise area and appears to have studied in Ardmore, Clashmore and Lismore, and eventually she settled down in Killeedy in East Limerick where she founded her monastery. There she ran a school which was responsible for the teaching of many early churchmen and women, including St Brendan the Navigator. So many passed through her hands that she earned the nickname "foster mother of the saints of Erin". St Ita is often described as the Bridgid of Munster, highlighting her position in the pantheon of Irish female saints, a close second to Bridgid of Kildare. For him, the well we now know as St Ita's, is known as Tobar Sionnaig or the Well of the Fox. What he actually says about it is this: "...though it is possible that the latter member of the name is personal. This well, which is nearly opposite the church and on the west side of the road, had a reputation for sanctity. Rounds or stations were said here, but have been discontinued for nearly a century"
I find it puzzling that Power would have no mention of a christian saint, if such a name was associated with the well at the time. Maybe he was going with the earlier work of another renowned placename researcher John O'Donovan and the staff of Ordnance Survey Ireland who between 1829 and 1842 completed the first ever large-scale survey of an entire country. Acclaimed for their accuracy, these maps are regarded by cartographers as amongst the finest ever produced. We've seen the lengths these early map makers went to for accuracy with the name of Faitlegg previously. Canon Power was well known for doing his research, and would seek out older members of the community or those with learning to seek further information. He does decry the lack of native Irish speakers in the parish at the time, but surely Ita or Idé would be a name that even the corruption of it would have giving him a clue. The fact that Power was a local (Callaghan), would have surely strengthened his knowledge of the area. I can draw no conclusions on this except to express the possibility that St Ita was a name of more modern origin, and one which O'Donovan and Power refuted, or at least ignored. Is it possible that the Power's of Faithlegg brought it with them, when the moved into the area in 1816?. Or is it an older name, that came to light after the efforts of the OSI and Canon Power. Again, only more research will possibly tell.